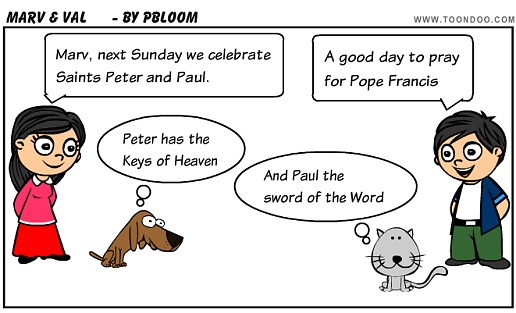 Bottom line: Today we inaugurate the Year of St. Paul. "As in early times, today too Christ needs apostles ready to sacrifice themselves. He needs witnesses and martyrs like St Paul. Paul, a former violent persecutor of Christians, when he fell to the ground dazzled by the divine light on the road to Damascus, did not hesitate to change sides to the Crucified One and followed him without second thoughts. He lived and worked for Christ, for him he suffered and died. How timely his example is today!" Almost every Sunday we read a selection from one of St. Paul's letters. The year provides a wonderful opportunity to learn more about the Apostle to the Nations. There are a lot of good books, but one I would particularly recommend is Alain Decaux' bestseller: Paul, Least of the Apostles (The Story of the Most Unlikely Witness to Christ). Decaux sketches Paul's life, beginning in the great city of Tarsus, then to Jerusalem where he pursues rabinnical studies and got caught up in the persecution of the followers of Jesus. He pieces together the elements which lead to his dramatic conversion and his three year retreat in Arabia before embarking on his remarkable career. Decaux takes up questions such as: What was Paul's "thorn in the flesh"? Was he a widower? What was it like to travel by sea and experience a shipwreck? "A very ancient tradition which dates back to apostolic times claims that their last meeting before their martyrdom actually took place not far from here: the two are supposed to have embraced and blessed each other. And on the main portal of this Basilica they are depicted together, with scenes of both martyrdoms. Thus, from the outset, Christian tradition has considered Peter and Paul to have been inseparable, even if each had a different mission to accomplish." "He was so anxious to convince, and he felt so much certainty that he was right, that one of his best commentators sees him not taking the time to articulate his reasoning: 'He vibrates, becomes heated, thinks of a thousand things at the same time, expands on the meanings of words.' Wanting to go directly to the essential, he sometimes lost his way, 'leaving the adversary disarmed if not convinced.' Yet he opened the way, nevertheless, to endless perspectives. His personality was overwhelming. His letters remain as unique documents that demonstrate at once 'an inner will, an impressive mysticism, a genius for synthesis. '...To become a religion (an established way of life), the message of Jesus needed him. Paul was the apostle of his universalism. He said, 'I have fought the good fight, I have finished the race, I have kept the faith.'"